Patea PNG Quilt Collective: August 5. 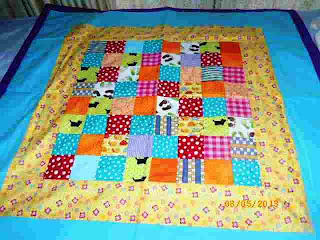 One quilt from Sue W in NSW. This lovely quilt arrived today from Sue W. in NSW, who emailed me to say she is not an expert quilter. Hey! Did I say I only wanted expert quilters to donate?? No - this is for anyone who is kind enough to use up some of their stash for a good cause! I think Sue's quilt is just as charming as all the others that have been donated so far.